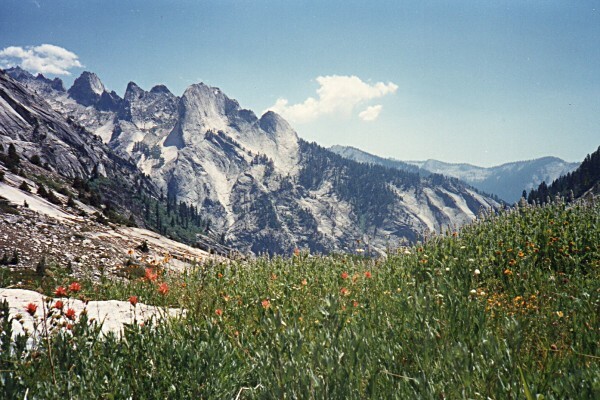 One of my favorite areas is the central Great Western Divide in Sequoia National Park. 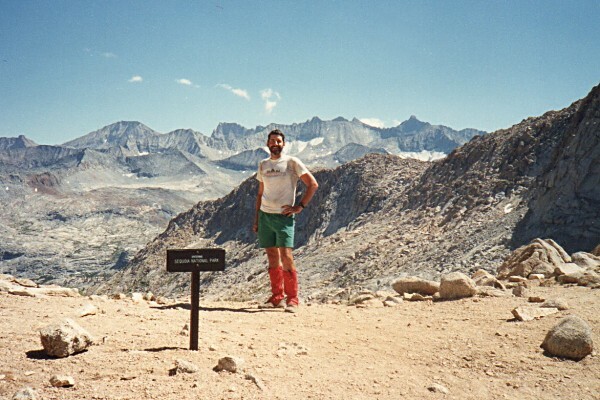 I had fond memories of crossing the Kaweah Peaks spur of the Great Western Divide in 1970, so I decided to visit that country again. 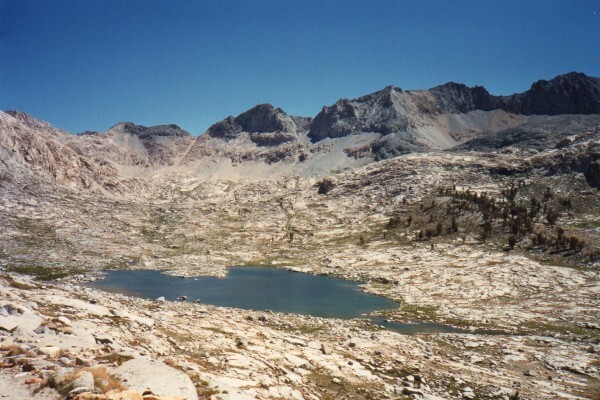 My plans were to find the easiest possible route into Kaweah Basin and to return via Colby and Coppermine passes. I had to make several changes in plan, but the trip was a success nonetheless. 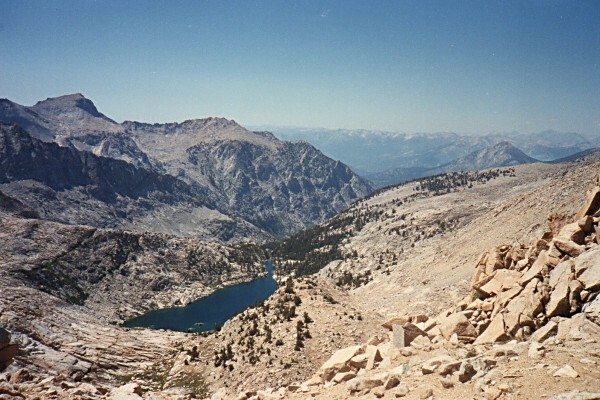 I named the trip Triple Divide Loop I because it was the first of several trips that centered around Triple Divide Peak which is located at the intersection of the divides that separate the Kings, Kern and Kaweah Rivers. I got a late start and wasn't on the Lakes Trail until 9:20. Shortly after leaving the Wolverton trail head, I caught up with an ecologist who was studying the effects of acid rain on Emerald and Pear Lakes. She said surface sediments are rapidly losing their capacity to neutralize acidic runoff and the lakes will probably be dead in several years. We parted at the trail junction where she continued on the Lakes Trail and I climbed to Panther Gap. I chose start from Wolverton rather than Crescent Meadow for two reasons. I had never been over Panther Gap and I was going to return via the Tablelands and the Lakes Trail which would deliver me to Wolverton. 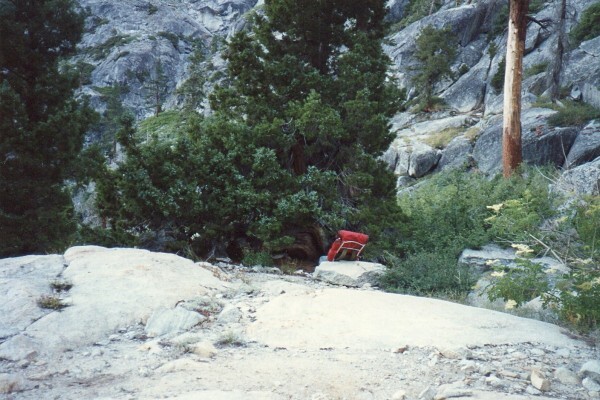 At a little after eleven, I stopped for my first lunch next to a trail sign which showed it would be another 2.2 miles before I would join the High Sierra Trail (HST). About an hour later I was there. The temperature rose at least 10 degrees during the descent to the HST. Near the trail juction, I ran into the trailhead ranger who was cleaning up illegal campsites in the area. A little after 3:30, I arrived at Bearpaw Meadow. The view across the Kaweah River canyon was just as impressive as I remembered it from the last time I had seen it 20 years before. 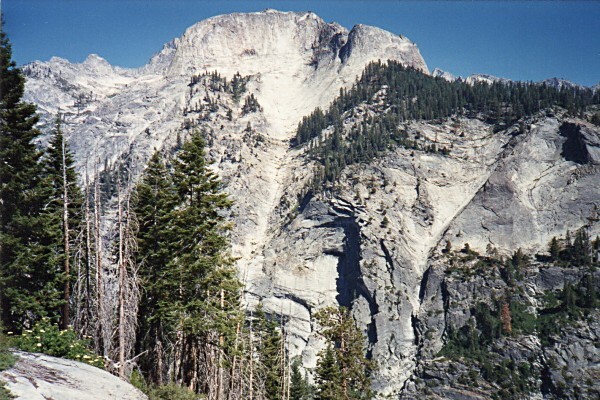 The view from Bearpaw Meadow is one of the most impressive I have ever seen. As I continued up the trail, my day's destination came into view. I was hoping to camp at Hamilton Lake. 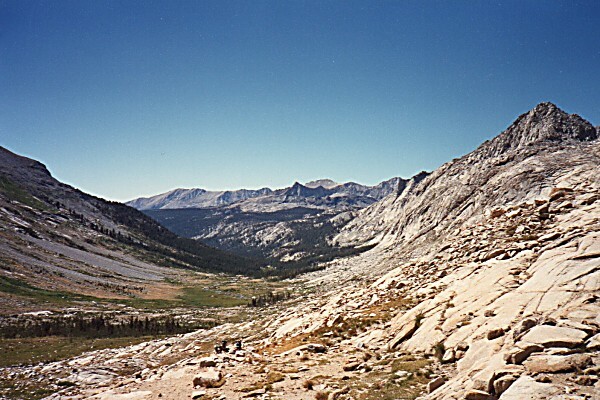 Valley of Hamilton Lake - Shortly after leaving Bearpaw Meadow, the Hamilton Lake area bursts into view. At 4:30, I was shaking rocks out of my shoes next to Lone Pine Creek. I stopped for dinner at the Hamilton Creek crossing. A hiker stopped on his way down from Hamilton Lake and told me that all the bear boxes there were filled with gear belonging to a trail crew and several Boy Scout troops. We traded a few stories and I made up my mind I would stay where I was for the night. I was on the trail at 6:30 the next morning after spending a very warm night under a juniper tree near the crossing. Juniper Tree Camp - I had a cozy night's sleep under this juniper tree near the first Hamilton Creek crossing. I slept outside my bag most of the night. 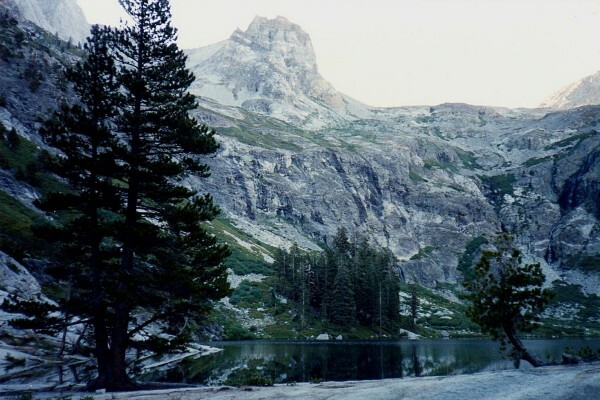 I began the hike under cloudless skies and arrived at Hamilton Lake an hour later. Hamilton Lake - Although the sun had yet to rise over the lake, you get some idea of its beauty from this low light photo. The place was well populated, all right, but I didn't leave the trail to visit with anyone. I stopped at Precipice Lake to take photos and noticed a hiker relaxing on rocks nearby. Kern-Kaweah Cols from Kaweah Gap - At the time I took these photos, I was hoping to find a direct route into Kaweah Basin. Little did I know, I would be crossing one of them the next day. 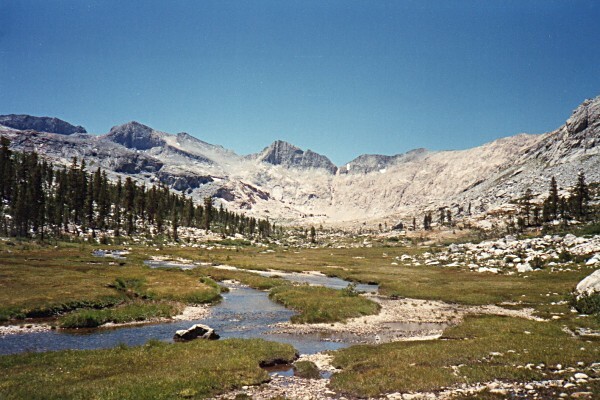 Big Arroyo from Kaweah Gap - The trail from Kaweah Gap travels down the Big Arroyo where it splits in three. 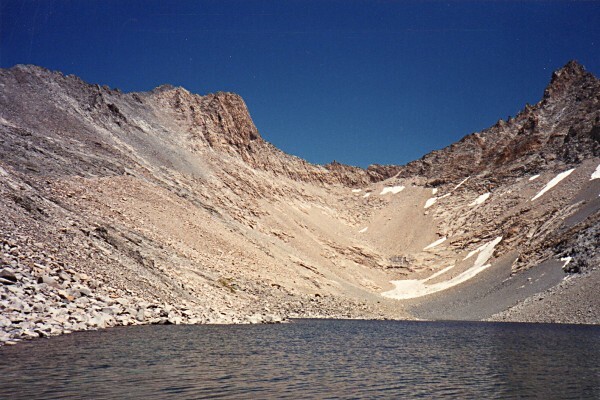 One route leads to Little Five Lakes, another to the Chagoopa Plateau, and the third continues down the canyon to where Lost Canyon and Soda Creek meet it. 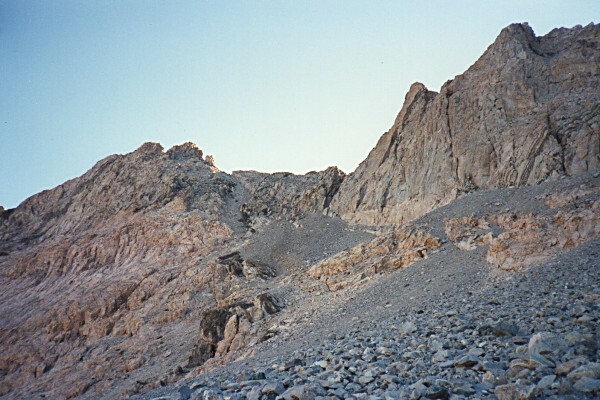 There is no trail down Big Arroyo to Kern Canyon although it is not a difficult cross country route. I did it in 1959 at age 14. I spent 20 minutes visiting with a lively group of six who had just come up the Big Arroyo. 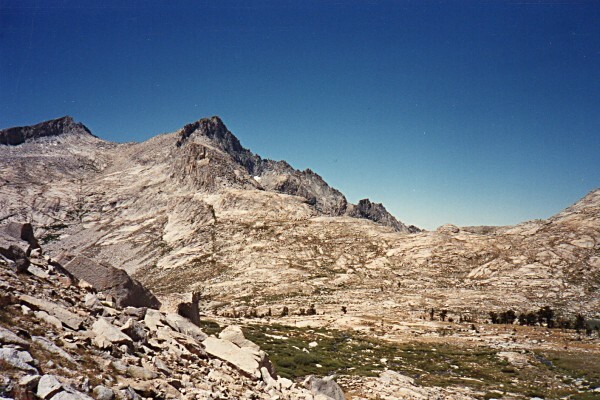 By noon, I had reached the other side of the basin and was looking back at Kaweah Gap. 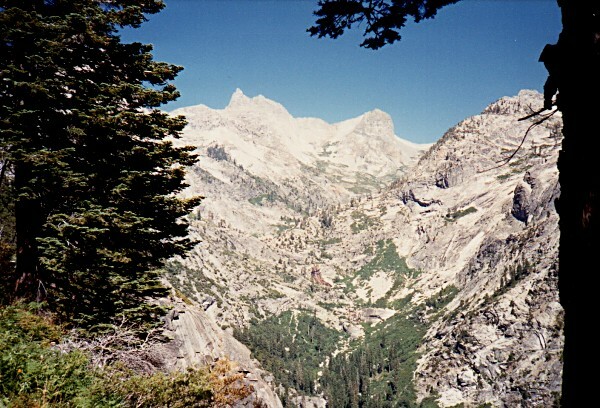 Kaweah Gap from the East - Once reaching the east side of Big Arroyo there is a great view of Kaweah Gap and Eagle Scout Peak. The wonders of the area included a cascade to nowhere. Cascades to Nowhere - Among the more interesting sights along the way toward Pyra-Queen Col is this cascade that disappears into talus. I continued toward Pyra-Queen Col and arrived at the large lake at the foot of the pass at 1:30. Pyra-Queen Col - I was concerned about the steep section at the top of the pass, so I looked for an alternate route. I studied the pass for a while and became discouraged. 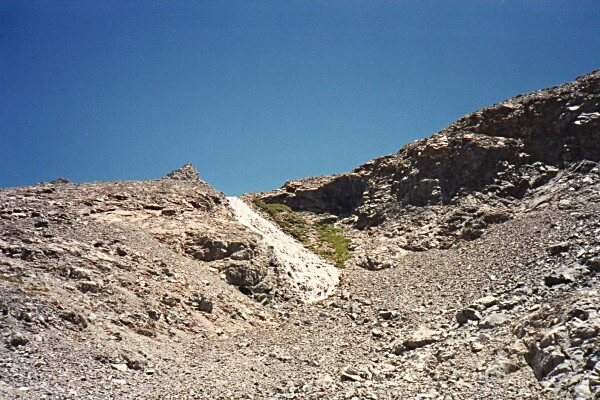 Most of the climb would be over talus but the pass looked much too steep at the very top. I decided to check out a possible pass in to Picket Creek. 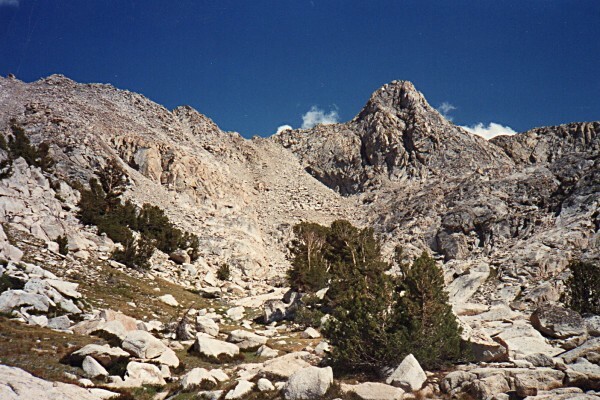 Black Kaweah dominated the view to the south as I worked my way up the sharp talus. Black Kaweah - From this viewpoint, Black Kaweah looks like some giant bird of prey cooling itself by spreading its wings. 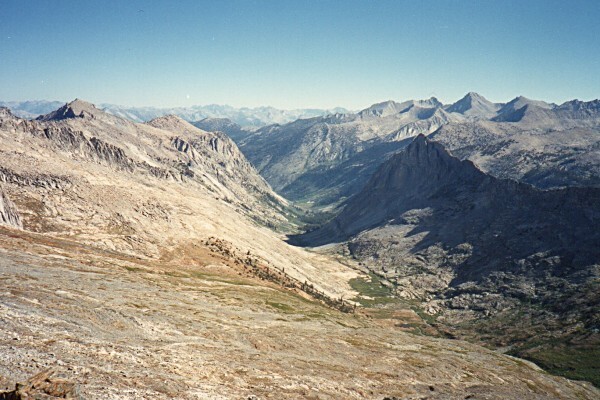 Finally, I arrived at the top of the divide and looked down a cliff into the cirque at the head of Picket Creek valley complete with a melting glacier and its moraine. Picket Creek Valley - The way into Picket Creek was blocked by a cliff. 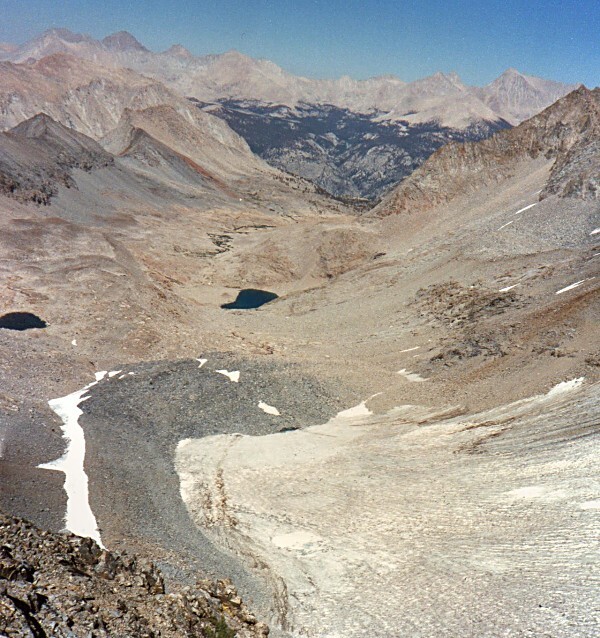 Far below, a large moraine lay at the base of a shrunken glacier. 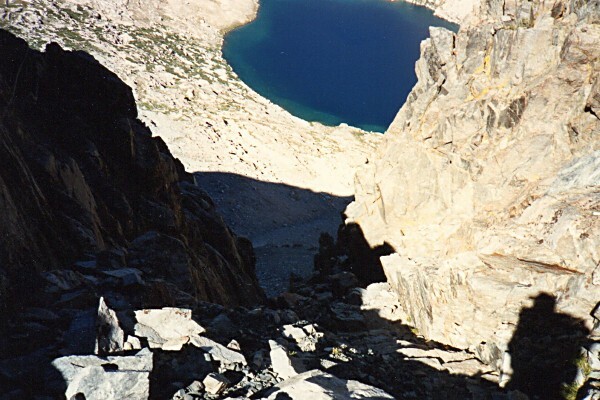 Discouraged by the difficulty of both routes, I headed toward Kern-Kaweah Col which I had crossed 20 years earlier without any problems. By 6:30 I had settled into my campsite and was feeling sorry for myself for not having been able to get into the Kaweah Basin. The next morning, I slept in until 6:30. It was chilly since I was on the west side of the divide. 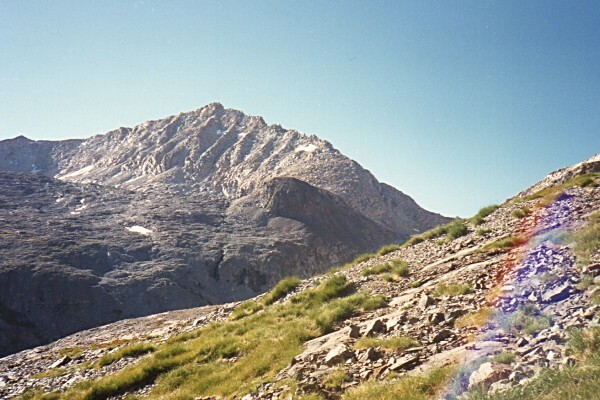 The southern Kern-Kaweah Col was visible from my campsite and I decided I would give it a try despite warnings that it was pretty steep on the west side. The topo showed it was much gentler on the east than the northern pass, so I decided to give it a try. 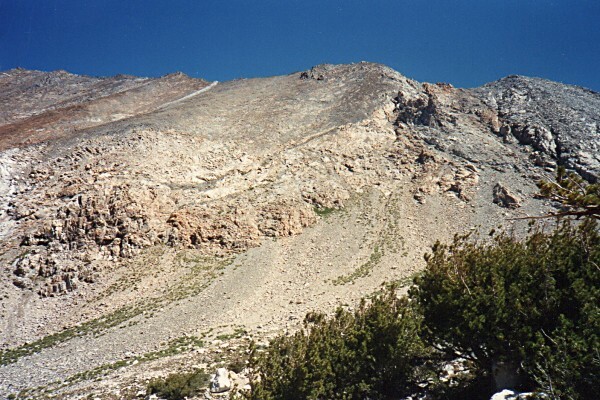 I finally started climbing toward the pass at eight and was at the top by 9:30. Kern-Kaweah Col South - Kern-Kaweah Col looked pretty easy except for the last section at the top. Even though it was steep, I never felt uncomfortably exposed. It turned out that there were abundant hand and foot holds in the steep section at the top. I never felt nervous, even with a full pack. The last section of the pass looked pretty hairy. Looking Down from the top of Kern-Kaweah Col South - This view gives an indication of the steepness of the last section. 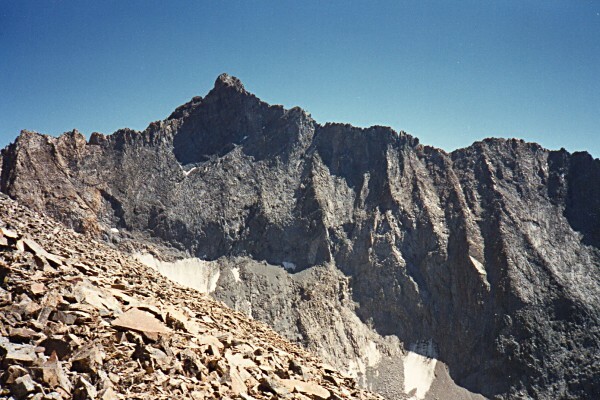 Peaks visible to the east included Mt Whitney and other 14ers and Milestone and Midway. As I walked down the Kern-Kaweah River, I checked the progress of a couple of hikers who were slowly climbing the northern Kern-Kaweah Col.
Kern-Kaweah Cols from the East - As I strolled down the Kern-Kaweah River, I watched in facination (over my shoulder) as a couple of hikers slowly made their way to the top of Kern-Kaweah Col North. I had lunch in a grove of trees north of the river then found my way to the Colby Pass Trail. I was on top of Colby Pass at three when a hiker all the way from Lyon, France caught up with me. Colby Pass from the North - I wonder if the climb is as tough as it looks. I'll have to try it from this side some day. and past Colby Lake to Cloud Canyon where we parted at about seven. 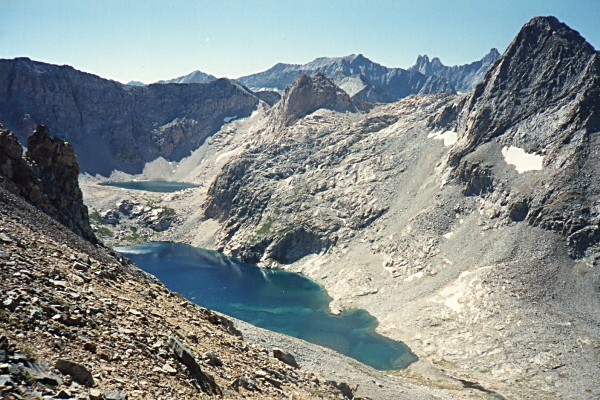 Colby Lake from Colby Pass - Colby Lake lay far below and to the north of the pass. Dinner was late that night but I finally got to bed at about nine. 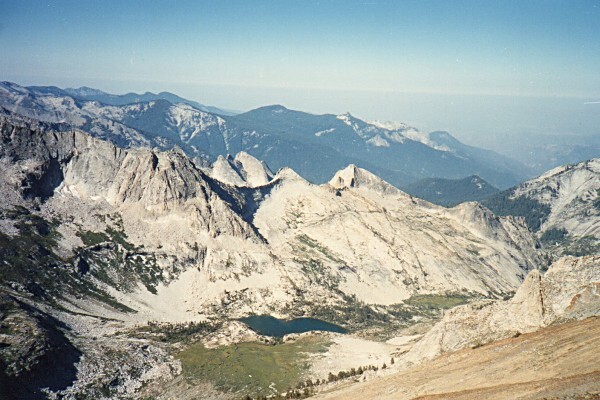 Triple Divide Peak from Cloud Canyon - This view of Triple Divide Peak shows how easy the route from the east (left side of photo) to the summit is. The upper end of Cloud Canyon is cold much of the time because it is out of the sun. Shadows from the Whaleback were still covering parts of the bottom of the canyon when I took this photo in mid-morning. By nine, I had reached the top of the divide at what I thought was Coppermine Pass. For about 20 minutes, I was totally confused. There was a lake in the valley before me and I knew that there were no lakes in Deadman Canyon which is what I should have been looking at. Finally, I figured it out. I was looking at Tamarack Lake because I had gone south of Coppermine Pass. Tamarack Lake from Above - I had not planned on this view. I thought I would be looking down into Deadman Canyon from the ridge top. Instead, I could see Tamarack Lake. I could have hiked north, but I decided that I would try to drop down to Tamarack instead. The view of Lion Rock and Lion Lakes was fantastic. Lion Lakes and Lion Rock - At least I had a great view of Lion Lakes and Lion Rock. Finally, I made Tamarack Lake a little after noon. It turned out to be a lot more effort working my way around cliffs than I had anticipated. 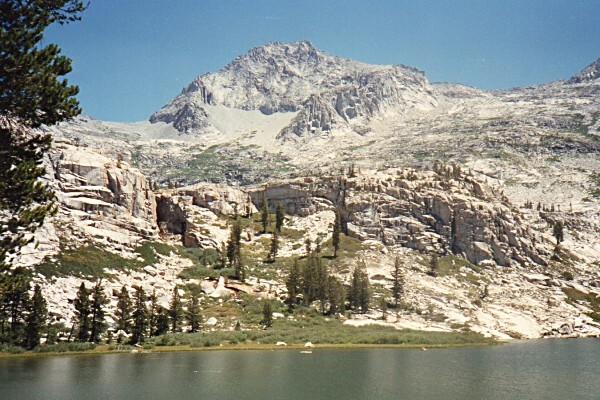 Kings-Kaweah Divide - I came down that? Actually it wasn't all that bad. Tamarack Lake was beautiful and it looked like it had a pretty good trout population, but I needed to be home that evening. 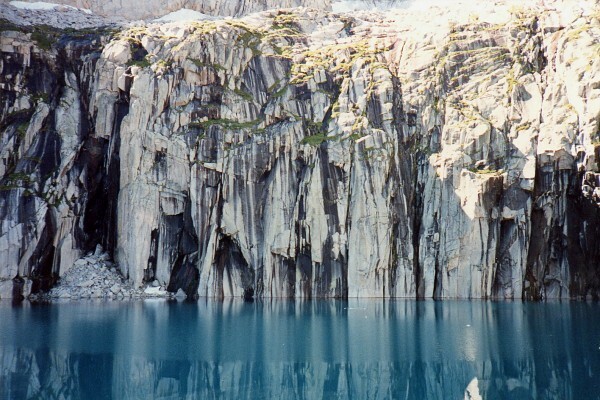 Tamarack Lake - This lake would be a lovely destination on its own. Lion Rock is in the background. By 2:30, I had made it to the Elizabeth Pass Trail where I found a lush flower garden. Garden at the Elizabeth Pass Trail Junction - This was the last photo I would take during the trip. The remainder of the day was devoted to getting back to Wolverton via the HST and Panther Gap. A little after three, I closed the loop and began the trudge back to Wolverton. I made it there at 8:45, the last hour of the hike assisted by flashlight.